This is a very easy meal which goes a long way. 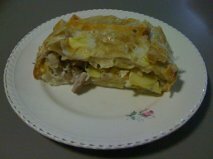 Chicken Strudel makes four to six serves, depending on what you serve with it. 1/4 Cup grated cheese (I use the bag from the supermarket which is a mixture of cheddar, mozzarella and parmesan). Mix the eggs, chicken, potato, cheese and chives in a bowl. Wrap all of the ingredients in the puff pastry in a strudel shape. Jab holes into the strudel using a fork to allow the steam to escape while cooking. Brush the top of the strudel with a little bit of the egg. Bake at 180 degrees Celsius for 30 minutes. Serve with vegetables and a squeeze of lemon. S, my youngest neice, really likes making things. Recently she found a project she liked the look of on the internet to beautify a mobile phone cover. 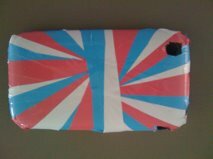 So, being a good Aunt, I volunteered my phone cover. The only problem so far has been my hair getting stuck to the sticky edges. 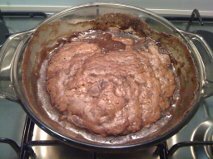 This is Mum’s recipe for Chocolate Pudding, which I expect is the same recipe that mothers and grandmothers and great-aunts all over Australia have been using for ever and ever. When Honey-bunny was in school, she used to horrify her teachers by telling them when she had eaten leftover Chocolate Pudding for breakfast (whenever she could hide the bowl from He Who Eats All of Our Leftovers). Does that make me a bad mother? The only difference I have made to Mum’s recipe is that she uses white sugar and I use brown sugar. Either is fine, brown sugar just gives the pudding a fudgier taste. Melt the butter and milk together and add the vanilla extract. Add the dry ingredients and stir out the lumps. Pour into a large casserole dish. Sprinkle the topping over the top of the batter and pour the hot water over the top. Bake at 170 degrees Celsius for 40 to 45 minutes. 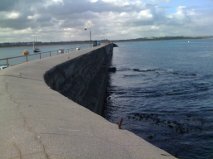 In case anyone is wondering, the photo above with the big blob in the water is actually a photo of Sammy, a seal who hangs around the boat ramp near the Warrnambool Breakwater. 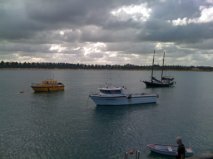 The day we were there, a fisherman was throwing Sammy the remainder of the fish he was filleting, and Sammy was tossing them away in disgust when he realised the meat had been removed. I took a few pieces of Muesli Bar Slice for Mum and my sister E to try, (only a couple of pieces because I didn’t think they would like it), but they both went crazy for it. Mum said it was very similar to a slice that her mother, Nana C used to make and asked me to write her out the recipe. E loved it and also had me write it straight into her recipe book in my best writing. Her recipe book is a fat old exercise book stuffed with loose recipes which I would love to get my hands on. 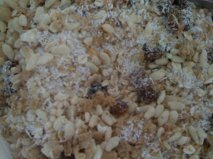 This recipe for Muesli Bar Slice is from the Magnificently Simple Marvellous Slice Recipes book and is another easy to make, no bake recipe that tastes really good. 1/2 Cup mixed fruit (I picked out the mixed peel, no one likes mixed peel. You could use sultanas or dried apricots or whatever you like). Mix these ingredients together in a large bowl. 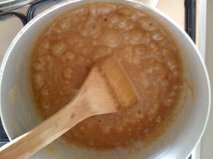 Place the butter, sugar, honey and peanut butter into a saucepan and mix together over a low heat until everything is melted. Bring to a simmer and continue stirring for about five minutes until the mixture starts to thicken. Mix the toffee mixture into the dry ingredients and press the mixture into a lined slice tin. Refrigerate until set, then cut into squares or bars. 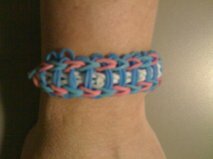 My neice, S, is a ‘loomatic.’ Absolutely mad about looming. Loomy in fact. S made the gorgeous watch in the picture above for herself and the bracelet below for me. I love the 1980’s colour theme on my bracelet. S made a snake for He Who Eats All of Our Leftovers and a yellow and black wristband for her Nana, who is a mad keen Richmond Tigers supporter. Every time I vacuum I gather up escaped looms. I’ve had a go at looming myself, using the crochet hook thingie and the board. I was crazy about macrame when I was S’s age, and made both of my grandmothers jute pot plant holders for Christmas one year. I made wall hangings and belts. 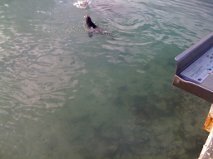 I may have to find some jute and show S how it is done. Macrame is looming on a grander scale. I love Florentines. Sometimes I buy a delicious Florentine biscuit with cherries and almonds toffeed together with a gorgeous chocolate base from a bakery near my usual supermarket (oh, let’s be honest, I buy one every time I go to the supermarket. The trick is only to shop once a week). I’ve never made Florentines before because I thought they would be too dangerous to have in the house. 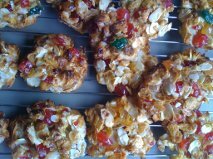 However, temptation got the better of me and I adapted a recipe I had to try and re-create the Florentines from my local bakery. However, I didn’t cook mine for long enough and they just didn’t turn out right. I won’t make these again, because even though I didn’t do the recipe justice, the recipe didn’t taste like those from the bakery. Because I didn’t cook mine for long enough, they tasted nice, but fell apart. There is a fine line between making sure these are cooked enough not to fall apart, but not so much that the cornflakes burn. Combine all of the ingredients except for the chocolate and mix well. Drop heaped tablespoons onto lined baking trays leaving room to spread. Bake for 10 minutes at 170 degrees Celsius. Let the biscuits firm on the tray before removing to a wire rack. Once cooled, ice the bottom of the biscuits with the melted chocolate. It’s hard to go past a nice Caramel Tart. 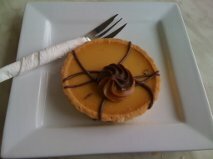 The Caramel Tart in the picture above came from a bakery called Pie in the Sky, which is in Tumut, in New South Wales. It tasted even better than it looked. We sat outside the bakery on a Sunday morning eating our morning tea, watching the world go by. The family at the table next to us had attended church earlier in the morning. The children all had that brushed hair, scrubbed faces, Sunday best clothes look about them. We on the other hand, were in muddy shoes and tracksuits after a hard day trekking the day before. However, regardless of our cleanliness or lack of, we all enjoyed our morning tea. He Who Eats All of Our Leftovers had a caramel milkshake and a lamington. S and I had hot chocolate. I love country bakeries, and Pie in the Sky is a really good one. Admittedly, Tumut is a long way from home, but if you are in the area, I can highly recommend a lunch or morning tea visit. I love Elin Hilderbrand’s books. I love Nantucket, which is the setting for Elin Hilderbrand’s books, even though I have never been there and probably never will. I love her characters, even though they are not real. 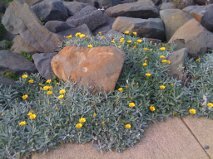 I loved feeling as if I were on a summer holiday at the beach while I was reading Beautiful Day, even though I was really on a Melbourne bound train at 6am in the morning, rugged up against chilly Autumn weather. Beautiful Day is a lovely story, with a really likeable heroine, Margot. The story is told through the voices of Margot, her family and their friends in the days leading up to Margot’s sister Jenna’s wedding. I’m probably like most women, and really enjoy reading about the fuss and preparations for Jenna’s wedding without any of the headaches of a real wedding. Margot’s life is complicated. There is a hunky hero hanging around, but there is a also a mysterious reason why she can’t get involved with him. To make matters worse, Margot is involved with a much older man, her father’s business partner, which is a big secret from her father and the rest of the world. Margot is a single mother with a high flying career, so guilt is her middle name, regardless of who she has a romance with. The other main voice in Beautiful Day is Margot and Jenna’s mother, Beth, who died long before Jenna met her Intelligent, Sensitive Groom-to-be, as Beth calls him in the set of instructions she has left behind for Jenna’s one day wedding in the form of a notebook. Jenna follows her mother’s instructions almost to the letter, which increasingly frustrates her father’s new wife. Beth has planned for Jenna’s wedding to take place at the family holiday home on Nantucket, and has written her opinion on everything from the menu to the tent in the garden to the photographer in the notebook. Beth even makes a comment for Jenna to follow on the wedding night. In my opinion, if she were real, Beth would be far too involved in her adult children’s lives, but since she is dead, she has become a saint and her opinions are valued and honoured. Everyone has a story in Beautiful Day, from Jenna’s best friend, who is a spoiled brat, to her father, who is unhappy in his new marriage, to the mother of the groom, who has invited her husband’s former wife to their son’s wedding. Some of the characters are happy, some are unhappy, some are smug and most of them make stupid, human, mistakes. 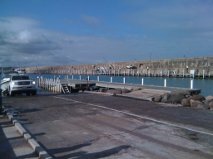 The location Nantucket, is almost another character, and of course, the beach is the place to be. Grease and line a deep round cake tin. Melt the butter and mix with the brown sugar. 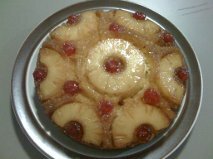 Spread the brown sugar mixture over the base of the cake tin and then arrange the sliced pineapple and glace cherries over the top. Cream the butter and sugar, then beat in the eggs one at a time. Using a metal spoon, alternately mix in the flour and pineapple juice. Pour the batter over the pineapple and cherries and bake at 180 degrees Celsius for 45 minutes.